ABSOLUTELY ADORABLE!! You will not need to do a thing to move into this 2 bedroom, 2 bath home. It features split bedrooms both with spacious walk in closets. Large Bedrooms, bathrooms and an inside laundry room. The hall bath has a solar tube and linen closet and is very spacious! The Living Room is open to the Dining Area, is Light and Bright and offers Laminate flooring. The Kitchen is framed with cabinets and counter space, has newer Stainless Steel appliances and ceramic tile. The Florida room is enclosed with glass windows, tile floors and a window unit for keeping cool in the Summer. Off the Florida room is a wonderful covered open lanai area with Ceramic Tile flooring perfect for enjoying the outdoors. In addition to all this it has a golf cart garage and full two car garage. 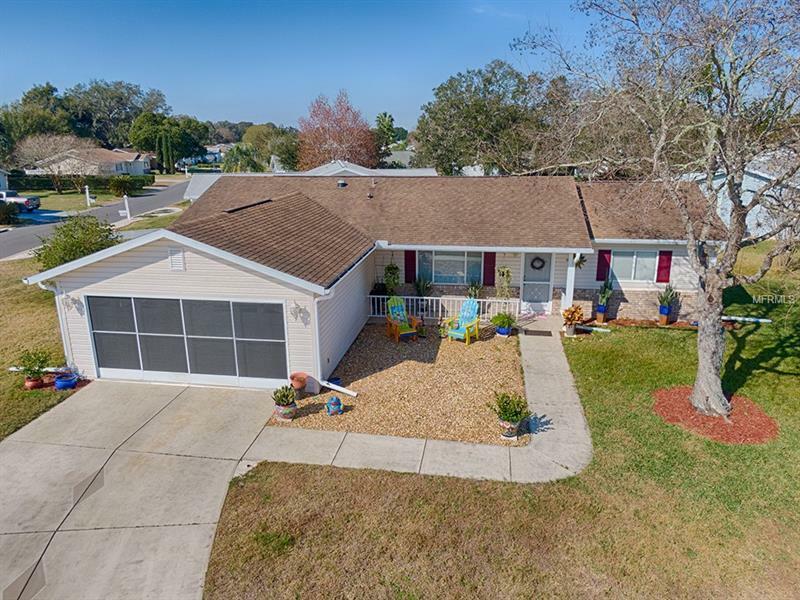 Situated on a corner lot in a Very Active 55+ community! The roof replaced in 2004 and the HVAC was updated in 2012! The Golf Cart is included!